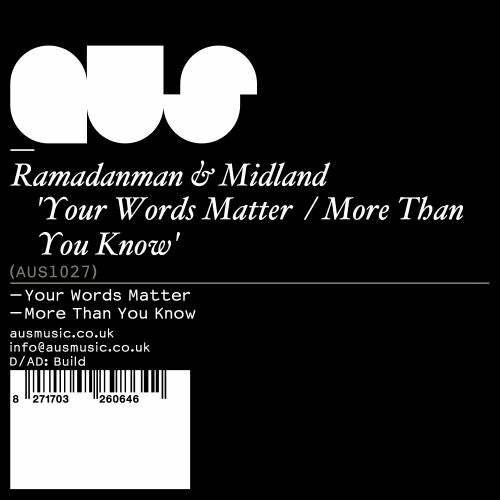 Long term friends Ramadanman and Midland partner up for their first joint EP ' 'Your Words Matter / More Than You Know' on Aus Music. Together they produce a truly innovative sound fusing the sounds and vibes of classic house and garage with the sub frequencies and aesthetics of dub step to create something completely fresh. Ramadanman (David Kennedy) co-runs the label Hessle Audio with Pangaea and Ben UFO and has graced us with several releases from his own imprint as well as esteemed labels Soul Jazz, Tempa and Critical Music. This will be his second release on Aus following the critically acclaimed Sous Le Sable with Appleblim last year, which was licensed to the hugely respected annual Steppers Delight compilation series on Soul Jazz. Midland is an all round music federate and firm believer that genres really are just made up to try and box people in. He aims to create a homogenous sound that people from different musical persuasions can appreciate. You could say he's a musician who thinks outside the box. 2010 looks set to be a busy year for Midland with this release preceding an EP on Phonica as well as remix work for a number of artists. Definitely one to watch.